I'm new to APP for iPad and I'd like some advice please on workflow. My typical situation is I'm away from home, don't have a laptop and would rather avoid having to upload any unedited images to any Cloud service just so I can re-download them and edit them, then presumably have to re-upload them. I just want to send either an out-of-camera JPEG or RAW from my SD or XQD card to APP or at least be able to choose in APP whether I want to edit the JPEG, RAW or both (one after the other, to compare and contrast). At the moment, the Apple card reader does import the photos into the Photos App, though I'm unsure whether it's both the RAW+JPEG (my old iPad's Apple Photo app gave me no choice but to import both, even though it was only the JPEG that I could access). When I open APP I can see the imported photos though each has 'RAW' in the top corner and it only allows me to select the RAW file. I can make edits to the RAW file easily enough but when it comes to exporting or saving, I encounter the previously reported problem of Apple photos not importing the filenames, and so APP can't see them either, giving you just the default export name of 'untitled'. This is a huge negative for me and puts me off using it, as it creates problems later when identifying the original file for saving. Is there a way for APP to access the photos from my SD card by bypassing Apple photos, which strips the filename? 3. Like others, I would like to import and preserve the file name. I realise the 3rd one may not be possible for a while, so solutions to 1 and 2 would be great, for now. Figured out the answer to something I'd asked. WD MyPassport Wireless Pro. Has an SD card slot. Can be accessed by iPad. Doesn't change saved file names. 5ghz Wireless. Thanks, DM1. I think this is a great solution if you need to offload large amounts of data while in the field, however, for my casual use it is overkill at the moment and the extra weight/size is not welcome. When importing from an SD card reader Apple Photos will import both JPEG and RAW if available. When using the Import from Photos option within Affinity Photo, you're previewing the RAW files embedded JPEG, but when you import only the RAW file is passed from Photos to Affinity Photo. I believe some other third party apps work differently and can access the iPad storage allowing you to select the JPEG or the RAW file to import, this may be something our devs look at in the future. I've recently migrated to a very elegant and inexpensive solution with many more benefits over the Photos app route. You have to use their free app iUSB Pro, but it gives you much more control over the files, retains the original file name, allows you to open-in either the jpeg OR the raw, and you can save back to your SD card if you wish. Only one caveat, it doesn't create previews for RAW files within the app. I shoot jpeg+raw. So, I just find the image I want to edit via the jpeg previews, then navigate to it's RAW companion. Then, open-in Affinity Photo. Easy-Peasy. Arrived yesterday via Prime 1-day delivery. I also have the official Apple regular SD card reader to compare to. First of all, I thought the iUSB Pro, app was buggy or something. Kept crashing on me when I tried to transfer images or video to the camera roll. Sharing/exporting/open in worked fine. Here's what I discovered.. at the bottom of the iUSB app screen there's an icon to view what's on the SD card. There are also icons for the App, Camera, iPad/iPhone, and settings. IMPORTANT: I first went to the iUSB icon to view my SD card content. That's where I was getting crashes. After I selected the iPad/iPhone icon to view the device's camera roll, I got the message asking permission for the iUSB app to access the camera roll. After I granted permission, everything worked well as expected. So, after you install the app, make sure you first go to the iPad/iPhone device icon so that you can grant the app access to the camera roll. The speed of transfer with the GeekGo seems slightly faster than the Apple SD card reader. Not blazingly so, but noticeable. What's GREAT about the GeekGo app is that once I've loaded an SD card and after it's built the thumbnail library of previews, when I reinsert the card later, it doesn't have to rebuild the thumbnails every time. The Apple one is not like this. If you have an SD card full of highres photos with RAW files, this can be very time consuming. The Apple reader has to rebuild the thumbnails every freakin' time. Not so with the GeekGo. Contrary to what the seller of the GeekGo has replied to users in the questions section, it DOES support photo RAW files. It just doesn't create a preview of the RAW files. I shoot JPG + RAW, so I just note the file number of the JPG file and open it's RAW counterpart. The Apple SD card reader only shows you one preview, but opens as RAW in applications that support RAW. I think I prefer the GeekGo method in that I know for sure I'm opening the RAW file specifically and not inadvertently getting the JPG preview or companion file. The Apple reader only supports SD, or micro SD with an adaptor. The GeekGo has both SD and micro SD slots so I don't have to carry a micro SD to SD converter with me. The GeekGo allows you to use the USB end to connect to an external backup battery to charge your device, while also transferring files to/from your SD card. I just tried this and it works fine. The app is a little finicky with regard to charging AND transferring, but I found that it seems to work better if you start charging first, then insert the SD card. The Apple SD card obviously doesn't do this at all. The Apple SD reader ONLY interfaces with the camera roll. Using the GeekGo and it's app, I can interface copy/move etc. with other file management apps. I just tried moving a video file to the iUSB Pro app and then onto an SD card in the GeekGo reader using the GoodReader app. Worked perfectly. I also tried using Apple's Files app and did the same thing. Worked just as well. This is a great find and solves a lot of file management issues I have using my mobile devices on the road. Excellent buy and highly recommended! Unfortunately this does not deliver to Australia. Sorry about that There are other similar products, but this is the only one I can vouch for with personal experience. Skiphunt, this sounds like a fantastic product. The Apple card reader really is such a piece of stunted rubbish, with Apple prices. Unfortunately, the geekgo doesn't ship to Europe, either. I'll contact the seller to see who the distributor is and if they've any plans to expand distribution. I agree the Apple Adapters are way overpriced and I never buy them. I have a cheap SD Card Reader it works well, but only with the Apple Photos App. The Geekgo Adapater looks very good, but also no delivery to Germany. I also heard very good things about the Sandisk IXpand drives. Some Apps like LumaFusion has nativ support for this USB Drive. Downside is the price is a little high. Thanks, Lutz. Let us know how you get on. I could at least order it from Germany. Which are the Sandisk Expand drives you're referring to? Do they have the ability to insert memory cards? Which are the Sandisk Expand drives you're referring to? Do they have the ability to insert memory cards? No they have a built in flash memory (32,64 or 128gb) and have a flexible body. This is so strange about the GeekGo not shipping everywhere. There are several things that make this a stellar product. That fact that you can plug it in to an external battery and charge WHILE transferring files is cool. I bought an extra fast Samgung U3 miniSD to basically use as this reader's dedicated storage. What's great is the app it uses. It can add a step here and there, but it gives you so much more flexibility each way. THIS is the way iOS file management should be handled natively IMHO. Do check with the GeekGo manufacturer. Possibly there's an identical product just branded differently for various markets? It's great to use with Lumafusion too. I have a RavPower hub that's also an SD card reader, an external backup battery, is an SMB device, and has a USB port that I can plug an extra solid state drive or USB flash drive to. With the GeekGo, I can transfer files to/from either an SD or miniSD care, while ALSO charging my device with the USB end of the GeekGo via the RavPower hub, and ALSO be transferring files to/from the RavPower vis it's own wifi network. All at the same time. Do I really need to be able to do that? No, not really... but it's cool that I can. When I'm traveling, sometimes I'll be in the room and want to transfer files before heading out to get a bite. This combo makes all of that much faster, so I can be transferring my still and video from one device, while also transferring my audio recording files with the other device. Here's the RavPower I'm using along with this. And yes, I've already tested and it works as I've described. One more thing... are you folks in countries other than the U.S. trying to search for the GeekGo via your own Amazon browser? I'm asking because maybe because you're going through my U.S. link, it's giving you that message? EDIT: Looks like you can buy the same GeekGo product directly from the GeekGo website. There are also some vendors selling the same project and shipping to more countries on eBay. Granted, they're a bit more expensive than the Amazon link I provided... but there are other avenues to get one of these in other countries. Here's the iOS app GeekGo directs you to use with their reader. Its free and I don't know if it's actually their app, or just a generic app. It doesn't get very terrific reviews, but I have a feeling that has more to do with sloppy GUI stuff. For example, when I first started trying to simply transfer files to the Apple Photos app but hitting the dedicated button for that... it kept crashing on me. I had to discover on my own that the iUSB Pro app needs permission granted to access the Photos app. Instead of just telling you that, it crashes. However, if you just go to the device icon first, it will ask for permission to access the camera roll from there. Grant it permission, then the copy to camera roll works perfectly after that. I'm guessing many haven't figured that out on their own yet and have been giving it poor reviews. I've been using it for about a month now and it's been pretty solid. It's also possible that this app might work with other USB devices connected via Apple's USB connection kit, but I don't have one of those to try. Skiphunt, I can feel your enthusiasm! I asked them about distribution plans outside the US and even if there weren't any, were they willing it to ship to the United Kingdom, accepting that I might have to pay customs and excise taxes. I'll report back if they reply. That eBay seller in the link I provided ships them to the United Kindom, Australia and several other countries. I haven’t personally used them though. Sorry, I hadn't seen your edit to a previous post giving the eBay link. I think I'm going to go for that, seeing as at least I'm covered if it goes astray, although I'll definitely have to pay import taxes. 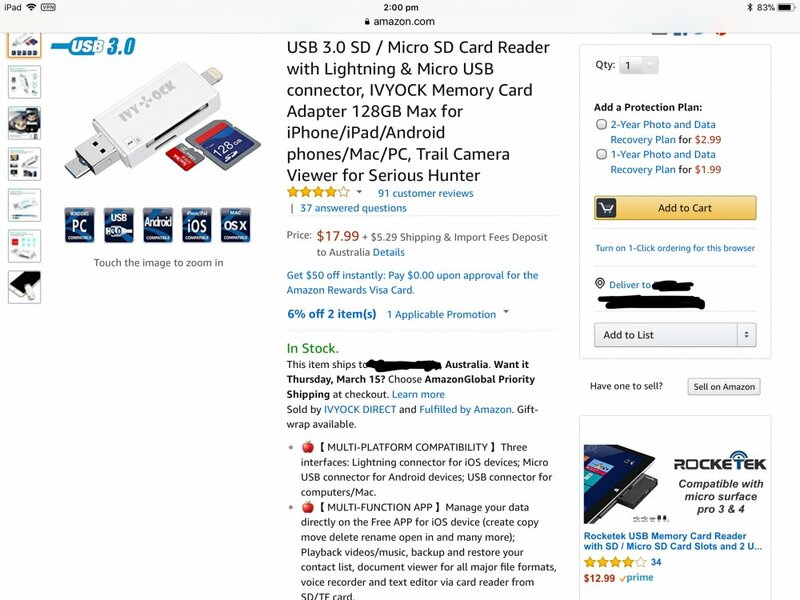 I'm wondering if it works with XQD cards, also, if I can connect the USB on the Geekgo to the USB 3.0 input on my camera? I doubt it. Any thoughts on an inexpensive way to get pics off an XQD card and onto an iPad without removing the file names and ideally being able to choose between RAW and JPEG are welcome! ‘I’m not getting this. When I import a raw from iOS photos into AP it doesn’t automatically load the raw develop editor. It just imports it like a jpg to the main edit screen. Am I doing something wrong? I think this is the same unit (differently branded) and ships worldwide at reasonable rate. Uses same app. The second option appears to offer offer same functionality but advantage of USB 3. Playing with the iUSB app. I don't have the reader to plug in so I am 'simulating moving photos from reader) by copying, from Files, a photo into the iUSB app. I can move a photo into the app from Files or Documents etc. That is pretty simple. I can't see any way though to select that photo (or any others within the app) and then 'Share’ it to Affinity Photo. How did you do that? When you say 'navigate to its RAW companion', where have you stored the RAW file. Did you move it out of the Reader/iUSB app to the Camera roll? I don't see a way to access 'Open in AP' from the reader app. Am I missing something in your workflow? I'm wondering if I can connect the USB on the Geekgo to the USB 3.0 input on my camera? I doubt it. 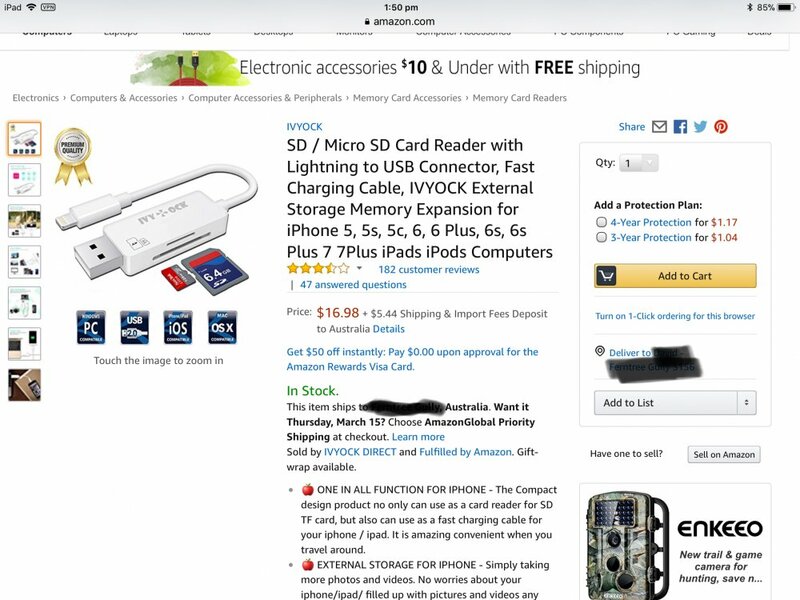 Reading some of the advertised 'claims' for some of these devices I have seen references to connecting USB storage devices (less than 100ma load) as long as you don't have sd cards etc in the readers. They must only handle one source at a time. Possibly this is why Skiphunt finds it necessary to plug into USB charger before inserting an sd card. Reader may be determining if there is a USB storage device connected. perhaps Skiphunt could test his reader with a USB memory stick in the USB side to see if it reads that sort of memory too. The second unit I posted about above, looks like it can do what you want. @DM1 GeekGo has one like that second option too. I went with the top one with the short cable, because the other one didn't say anything about it being able to function for charging too. I also bought the one with the short cable so that it'd be easier to connect to iPhone & iPad with cases on. I'm not surprised it uses the same app... it looks pretty generic. I bet the iUSB Pro app works with a lot of devices, but I don't have other ones to test myself. No, I don't move the RAW files to the camera roll. I don't even really have to use the Photos app at all actually. After I put the SD card in and read it in the iUSB Pro app, I see all of my JPG images first, then after that I see all the same files, but their RAW counterparts. I shoot RAW + Jpeg and I've tested this with Olympus and Panasonic. Haven't tried Nikon yet, but I'm certain it'll work the same. I thought of that, but all of my USB memory sticks are male USB, as is the USB end of the GeekGo reader. I could buy a male to female convertor I suppose, but I don't really need one because I can read USB memory sticks, as well as solid state USB drives from the USB port on my RavPower portable wireless hub that I referenced earlier in the thread. Also, many of these devices... including the GeekGo ones, are promoted to be used with hunting/trail cameras. So, I bet any of them making this claim would be compatible with plugging right into the camera. I don't have any cameras with the standard size USB port for file transfer though, so I can't confirm. Under App there is no 'Open in' option. Is that only available under iUSB? I can't access it without the reader. I’m using ‘open in’ as I described... via the iUSB Pro app, but directly from my SD card in the GeekGo reader. No Photos app transfer needed. Just transferred a RAW file into the iUSB app and disconnected the reader. I can STILL ‘open in’ for the iUSB app without the reader at all. Once file is moved into iUSB app, select ‘App’ where you see you RAW file. Then click top right where it says ‘more’. Then click ‘edit’ top right. Select your file, then click ‘Action’ bottom left. At this point you’ll have either Open in, Email, or Rename.